Hometown: Pennsauken, New Jersey, U.S.
Died: July 10, 2007 in Operation Iraqi Freedom. 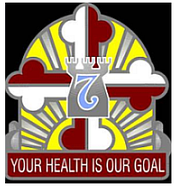 Unit: Army, Kirk U.S. Army Health Clinic, Aberdeen Proving Ground, MD. Capt. Maria I. Ortiz of Bayamon, P.R., had been serving in Iraq since September, was caring for wounded Iraqis at a hospital inside the fortified district that also hosts the U.S. Embassy and Iraq's parliament. Everyone who ever worked with Maria adored and respected her. She was one of those truly exceptional people who transcended her professional status with loving care for those she nursed and worked with. She touched everyone's lives and everything about her was positive. She always carried a smile. Born in Camden, New Jersey, Ortiz grew up in Bayamon, Puerto Rico. She had been assigned to Kirk U.S. Army Health Clinic at the Aberdeen Proving Ground in Maryland, where she was chief nurse of general medicine. Maria was the first Army nurse killed in Iraq since the 2003 U.S. invasion. She died in Baghdad, Iraq, of wounds suffered from enemy indirect fire at age 40. Capt. 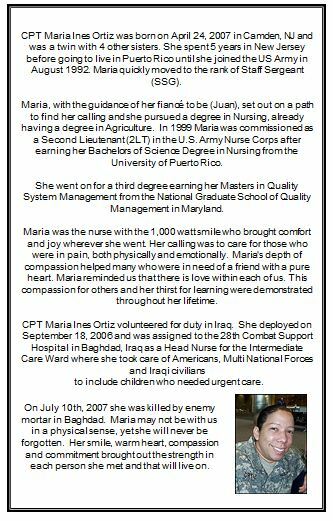 Maria Ines Ortiz had a smile that lighted up the hallways in every hospital where she worked, from Aberdeen to Walter Reed to Iraq. When a patient needed extra care, the Army nurse would stay late. If a colleague was feeling blue, she was there. Ortiz, 40, was killed last week by a mortar attack in the Green Zone in Baghdad. The Edgewood, Md., resident is the first Army nurse killed in combat since the Vietnam War, Maj. Gen. Gale Pollock, the Army's acting surgeon general, said in an interview yesterday. "Having one of the family go down is very, very hard," said Pollock, who also is a nurse. "You feel like a piece of your heart is gone." Ortiz was returning from physical training July 10 when she was caught outside by a barrage of mortar shells. She was killed by shrapnel. "If there was such a thing as the jewel of the clinic, she was the jewel," said Renee Smith, who worked with Ortiz at an Army health clinic at Aberdeen Proving Ground in Maryland. "Her work wasn't finished until everybody was cared for." Ortiz's death has hit hard at Aberdeen, where she served as chief nurse at the Kirk U.S. Army Health Clinic for 18 months before going to Iraq last fall. Many broke down in tears when the clinic commander called everyone together and told the news. "It really took everybody by surprise," Smith said. "God, it's a great loss." Patients who knew Ortiz have "run in here in disbelief," said Maj. Kathy Presper, chief of medical management at Kirk. "She was dedicated, a step-up-to-the-plate type person." At Walter Reed Army Medical Center, where Ortiz served from 2001 to 2003 as a dialysis nurse, Medical Command officials are considering whether to honor her by naming a building or clinic in her memory. "She has many admirers and friends," Maj. Gen. Eric Schoomaker, the hospital commander, said yesterday. Ortiz volunteered for duty in Iraq and was eager to go do her part, colleagues said. "She was very proud of the fact that she was going to go over to take care of soldiers," said Wanda Schuler, a co-worker at Aberdeen. 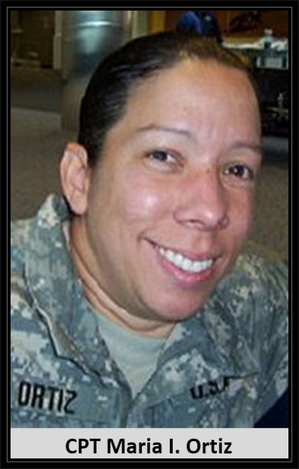 When Schuler sent an e-mail asking Ortiz whether she needed anything, Ortiz asked her to send Christmas decorations she could use to brighten up the halls at the Army's 28th Combat Support hospital, where she was assigned. "While she was caring for patients physically, she was caring for them emotionally, too," Schuler said. "She tried to make it as cheery as possible." Ortiz was home on two weeks' leave recently and paid a visit to the clinic at Aberdeen. "She said it was going well, and she felt like she was making a difference there," Smith recalled. Colleagues at the Baghdad hospital held a memorial service for Ortiz soon after her death. "They gathered together, and they talked about how she touched their lives," Pollock said. Ortiz, who was born in New Jersey and grew up in Puerto Rico, joined the service as an enlisted soldier with the Army Reserve in Puerto Rico in 1991, and she became active duty in 1993. She was commissioned as an officer in 1999. Ortiz was engaged to be married to Juan Casiano upon her return from Iraq, friends said. A memorial service for Ortiz is set for tomorrow at the Aberdeen clinic. A date for burial at Arlington National Cemetery has not been set, cemetery spokeswoman Kara McCarthy said. Army nurse killed in Iraq had ties to Md., N.J.
PENNSAUKEN, N.J. — An Army nurse based in Aberdeen, Md., who died in Iraq this week had roots in southern New Jersey, officials said. Capt. 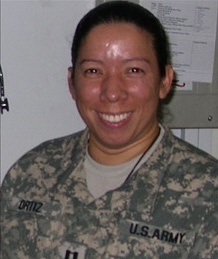 Maria I. Ortiz, 40, was killed Tuesday by enemy mortar fire in Baghdad, the Defense Department said. Army officials identified Ortiz’s hometown as Bayamon, Puerto Rico. But a military spokesman said the nurse’s mother, who was not named, lives in Pennsauken. Ortiz reportedly was born in Pennsauken, but it was not clear how long she lived in this area. She was assigned to the Kirk U.S. Army Health Clinic at Aberdeen Proving Ground in Maryland. Ortiz was the 79th service member and third woman with ties to New Jersey to die in Iraq. Ortiz graduated from the University of Puerto Rico in 1990 and joined the Army Reserves in Puerto Rico the next year, said Mercer. Two years later she went on active duty in a career that took her to Honduras, South Korea and Walter Reed Army Hospital in Washington, D.C.
At Kirk, Ortiz was the chief nurse of general medicine for 18 months. She left in September 2005 for Iraq, where she served with the 28th Combat Support Hospital, 3rd Medical Command. 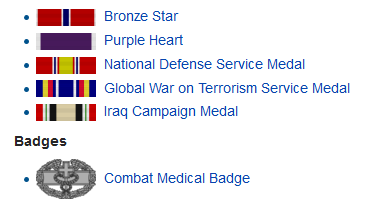 Ortiz earned a number of commendations, including the Bronze Star, Mercer said.